I just had to follow up with a response to my last couple of posts. I got so many tender and genuine comments from you all about how The Once Over struck a cord with your heart. This idea that we all feel insecure, criticized and vulnerable about our bodies is not new. But yet, we don’t talk about it. This absolutely breaks my heart. So I invite you to help me open up the conversation. I don’t think my head is floating in the clouds when I say I believe, without a doubt, we could change how we see ourselves and view each other if we could put on the right perspectacles. We are all hurting and yearning to break free from the cultural pressure that says we must look a certain way, be a certain shape or size, have the perfect skin. But we each bear imperfections. We bear scars. And somehow our imperfections are frowned upon rather than celebrated. Our scars are rejected rather than embraced. We see our bodies for what they look like, not for what they can do. And I want nothing more than to see them differently. To see them through the eyes of acceptance and gratitude. I want this so deeply. For me. My daughters. My niece. My sisters. My friends. And you. 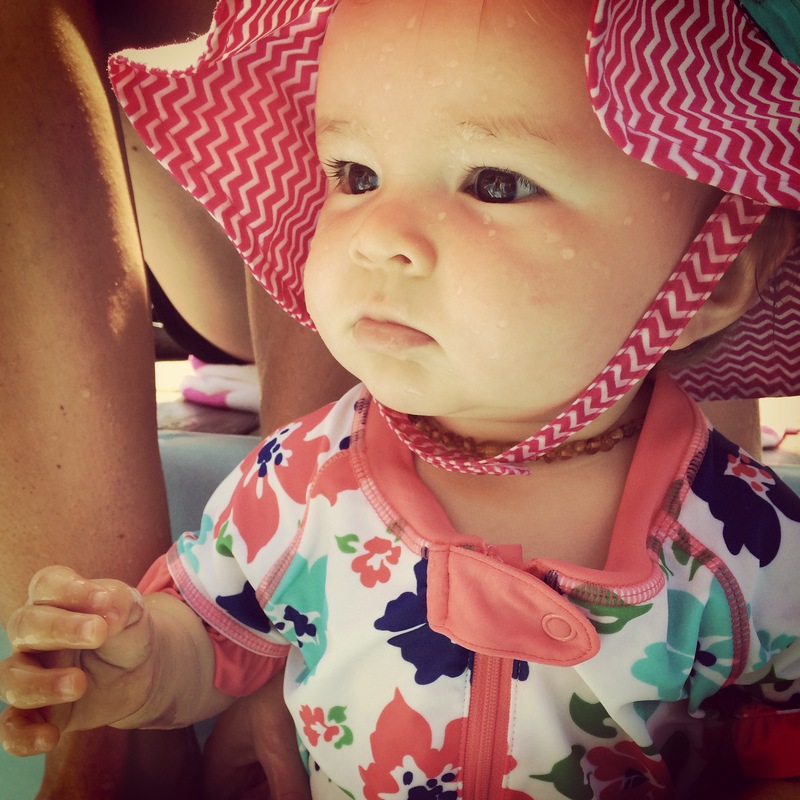 I have to confess, since writing my post on the once over, I have been asked multiple times by different swim instructors when Kensington (my youngest) is going to start swim lessons. She is tiny enough I would have to accompany her in the water. My first response, when telling my husband about this, was that I don’t want to have to go through the hassle of getting myself AND three kids undressed-dressed-undressed-and-dressed again. But then of course he gave me those eyes that say, “Are you really sure that’s what it’s about?” and I immediately confessed. Deep inside me there’s fear. Fear of judgement. Fear of criticism. Fear of not measuring up. I don’t want to be the mom, baby in tow, getting the once over. It makes me hot with embarrassment. And as I picture myself making the long walk over the pool deck, the only word echoing through my mind is: cellulite. Yes. It is FAR more comfortable and FAR less risk to stay covered up, invisible on the sidelines. And my heart breaks for me. And so, do you know what I’m challenging myself to do today? I’m challenging myself to sign my baby up for swimming lessons. Lessons in which I will have to get into my swim suit, walk the swim deck and brave the once over. I am challenging myself to submerge my fear and fully show up to my ONE life. I also wanted to update you on my last post The Very Last Hour! I wrote about how difficult and uncomfortable it has been to sit in the position of not knowing where we’re going to end up living. I shared the story of our past experience with this and I confessed my current fears. And in looking back, I was reminded how God is a miracle worker and He thrives at providing for us at the very last hour. The very day I posted what I wrote, we got a miracle. In the later part of the afternoon, my husband stumbled upon the place we are now moving into at the end of the month. My husband hadn’t looked on Craig’s List prior, because our history of looking on there hadn’t been good. But he thought, what the heck! And the very first house he came across had JUST been listed. AND it was a home we KNEW! When we lived in Oregon, Jeremy’s San Diego based company paid for us to come down to San Diego and rent a house for a month. They wanted Jeremy to work on a few big projects in person. We rented a darling little house with a great backyard, in one of our favorite neighborhoods. A month of staying there was long enough to create a few routines and memories: walking to the coffee shop or to the beach, snuggling and reading on the couch, cooking a number of meals together, having our San Diego friends over for a meal or play date. We even celebrate two birthdays in that house. We lived so much life in that one month, my memories of the house were extremely tender. And this is why I am not surprised, but at the same time, blown away by His miracle. THIS is the SAME house we are moving in to! And just to top it off, the house has a casita (a tiny guest house) where my sister (who is currently living with us) gets to live! All of these details are are not lost on us. They are an overflowing of His love and nothing short of a miracle. Wow Audi!! I just finished catching up on your house-search journey & wanted to thank you for sharing!! I went through something similar when we sold our house & moved about a year ago – such a struggle but God is faithful & here we are in a great place now. 🙂 It made me tear up to hear you guys get to move into a familiar home!!! God is so amazing!!! Love you friend & praying for this transition! I believe in miracles and I loved reading about yours!